As I mentioned in the recent entry about my weekend in Hua Hin, the people whom I was there with, Tawn’s colleagues, are foodies. Specifically, they are sea-foodies. I’ve never seen a group of people remove quite so much crab meat from a pile of shells in so short a time as this bunch of diners. As for me, I really enjoy seafood but there’s also a point where enough is enough, especially back-to-back meals of the same things. Let me share with you what we ate, so you can appreciate it, too. 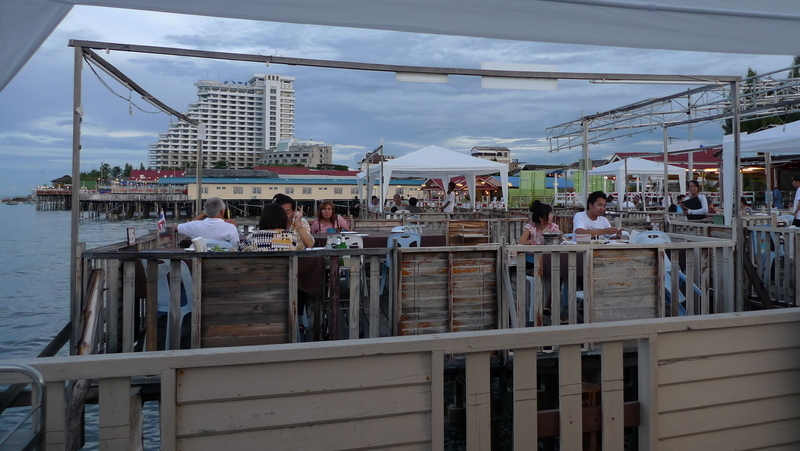 Our main meal was at a popular local restaurant in the heart of Hua Hin town, an unassuming place that looks more like a loading dock with tables. “Loading dock” would actually be an accurate description, because it is adjacent to the fishermen’s wharf. 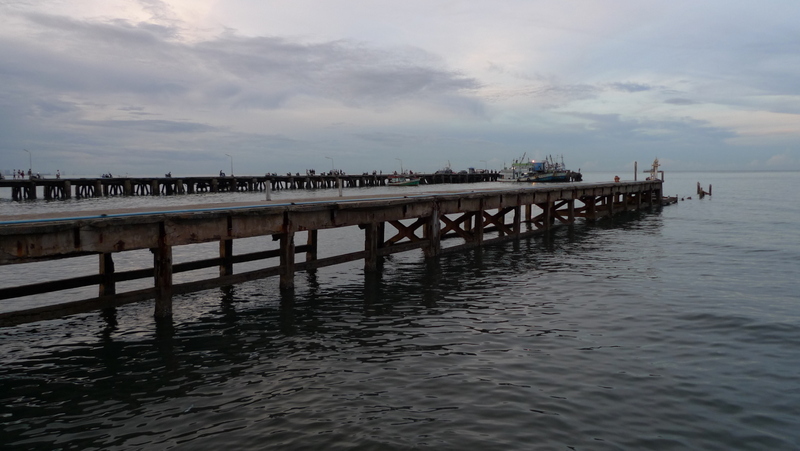 Unlike such piers in some corners of the world that have become tacky tourist spots, these are the unassuming working jetties where the fishing fleet comes to offload their catch of fresh prawns, crabs, fish, oysters, scallops, and other delicacies of the deep. Based on my experience, there are few places where you can find seafood more fresh than the fisherman’s wharf. Tables are placed on a series of extentions to the main dock, a series that seems rather haphazardly added on based on an expanding clientele. The entire family (or families) seem to be at work, with youngsters sorting out fresh shellfish with each order that is placed. 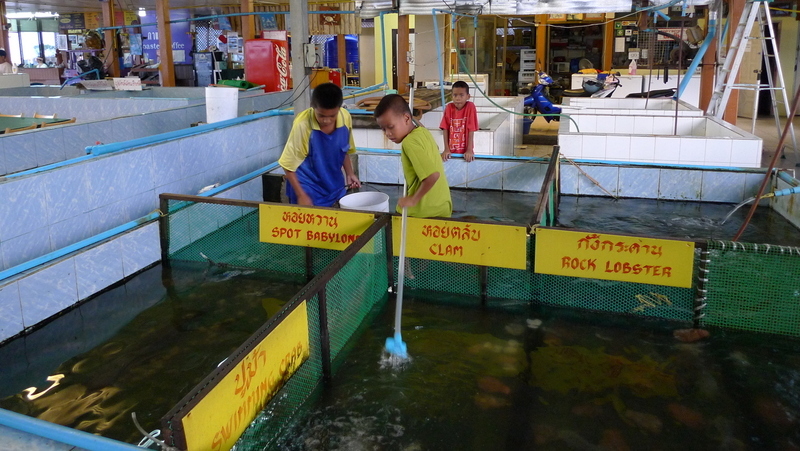 Half the main floor area is a series of tanks which are filed with different types of creatures depending upon demand. This being low season, only about half the tanks had occupants. I have no idea what the “spot babylone” is. 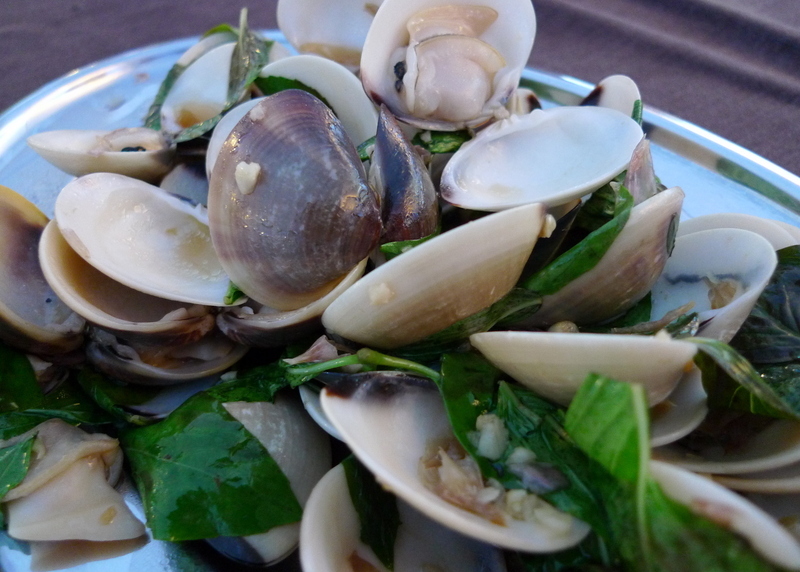 Clams with garlic and basil. Very sweet meat. Fried squid. Instead of cutting these into rings, this restaurant cuts them into strips. A bit overcooked, I thought. Lump crap meat, scrambled eggs, and green onions with tumeric and curry powder. My favorite of the dishes. 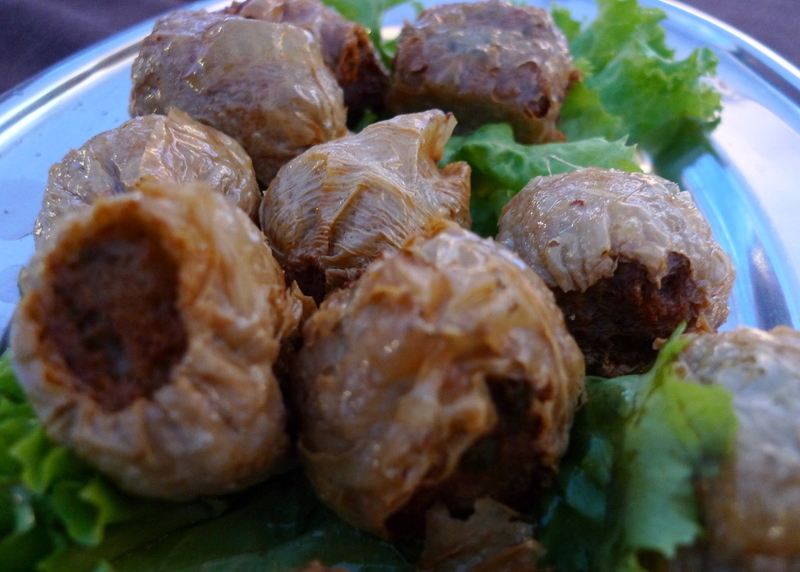 Hoy jaew – a crab meat sausage wrapped in tofu skins and steamed then deep fried. 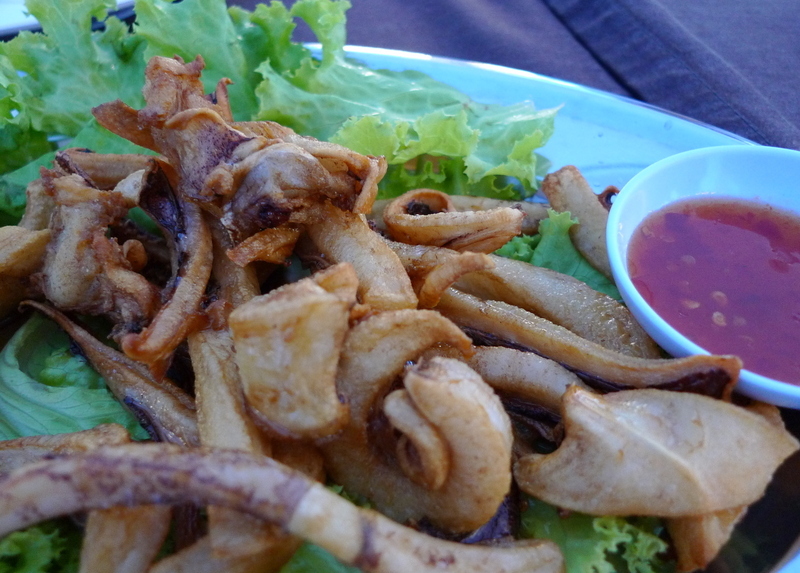 I wrote last month about a restaurant we went to in Chonburi that is famous for these. Entry is here. Raw oysters. 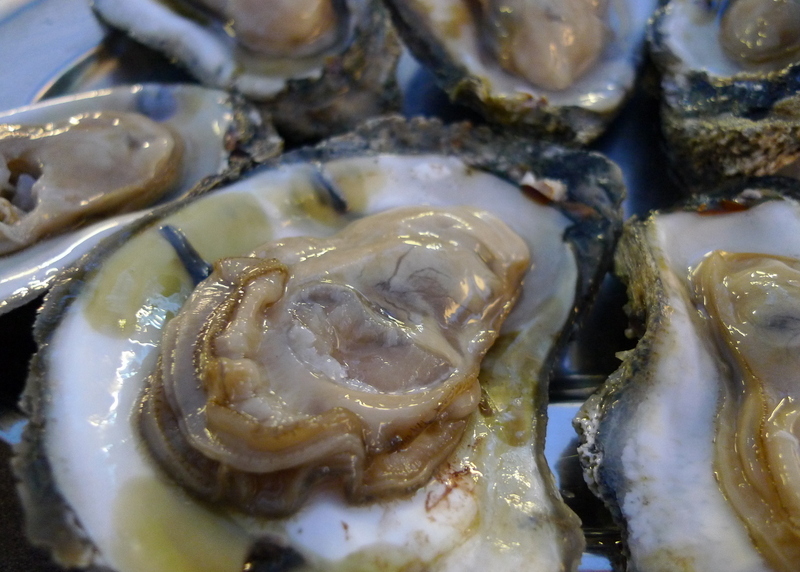 These were large and very briny tasting, not as clean a taste as I enjoy. Garnished with a very pungent herb, salt, lime juice, and toasted shallots. Boiled prawns. The crab and prawns were served with a super-spicy dipping sauce. Two of Tawn’s colleagues enjoy the meal. Looking behind them you can see the various seating areas, each with a tent roof. The solid roof structure way in the back is on the land, which is where all the holding tanks for the seafood are. 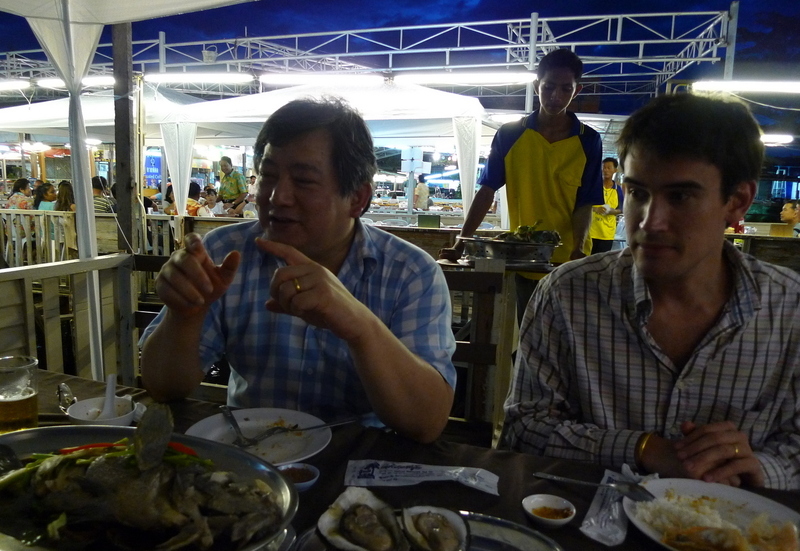 After the seafood dinner, we went to one of the night markets in Hua Hin. The traditional night market is on the city streets and is very crowded. There is a new area that has been set up that is a bit more park-like and focuses on the arts. There was a live band playing in a small ampitheatre, a food court area, and lots of vendors selling everything from paintings to clothing. Above, a pair of Tawn’s colleagues posed for pictures. Picture taking was a big part of the weekend. 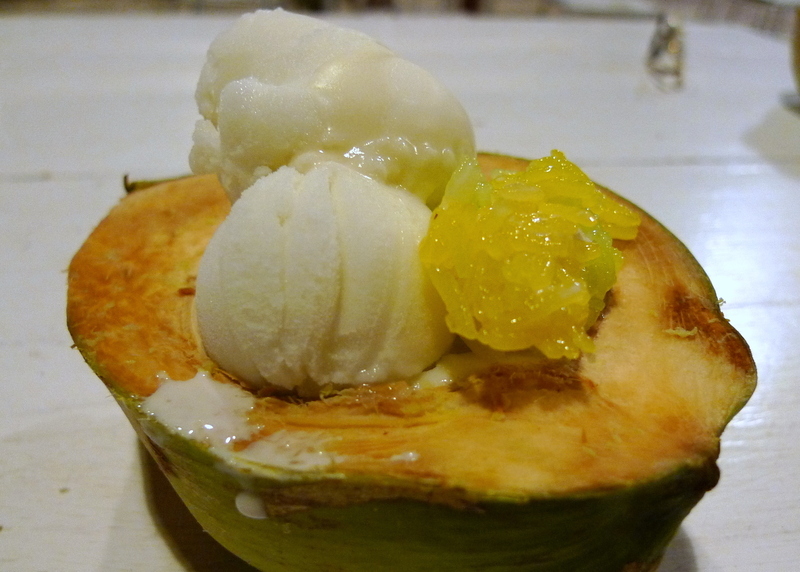 At the night market I ordered some coconut ice cream served with sticky rice in a hollowed-out coconut shell. The meat of the coconut was cut loose with a little device so that I could eat it with the ice cream. Did I mention that picture taking was a prominent activity? The next day after class we stopped for lunch at another seafood restaurant before driving back to Krungthep. I didn’t take any pictures because, well, it was pretty much the same menu all over again. 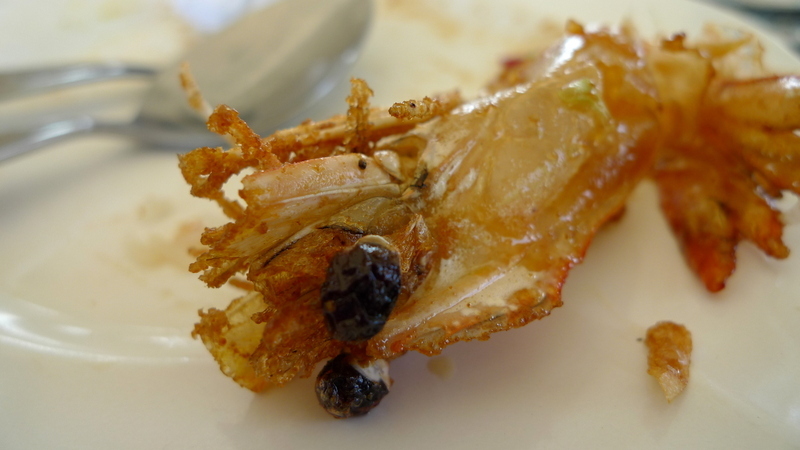 I did take a macro photo of this fried prawn head, though, because I thought it was kind of interesting. 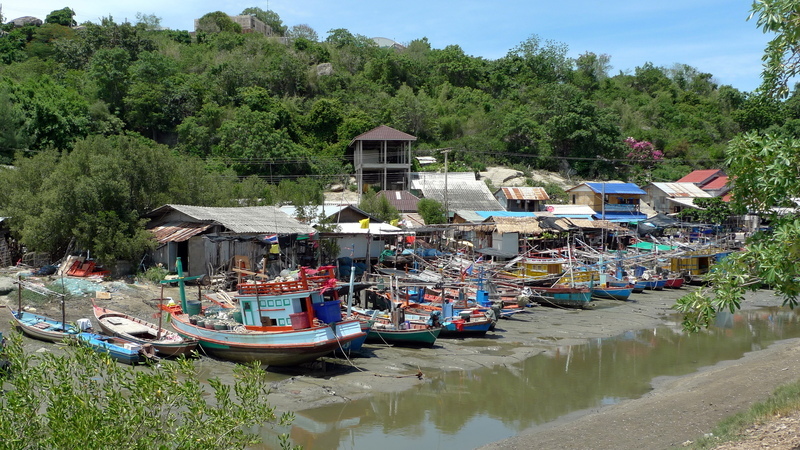 The restaurant we went to was in a small fishing village on the south side of Hua Hin. Interestingly, the tide was out, leaving the whole fishing fleet beached. 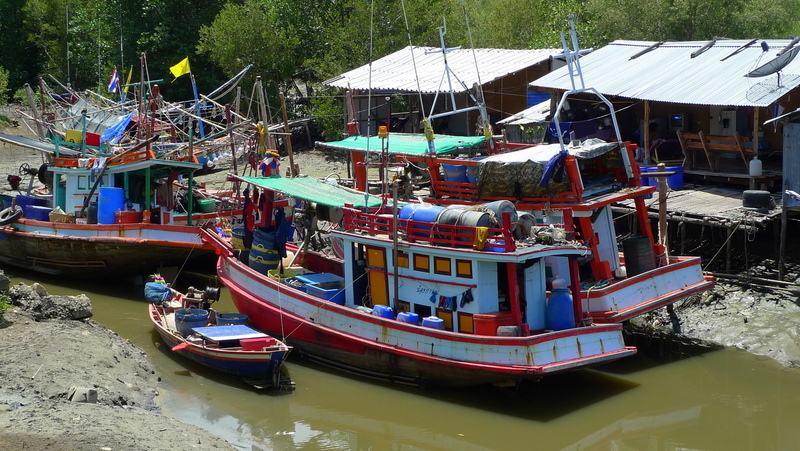 Thai fishing boats are very colorful. So that was my weekend in Hua Hin with Tawn’s colleagues. Very fun opportunity and I’m glad to have had it. 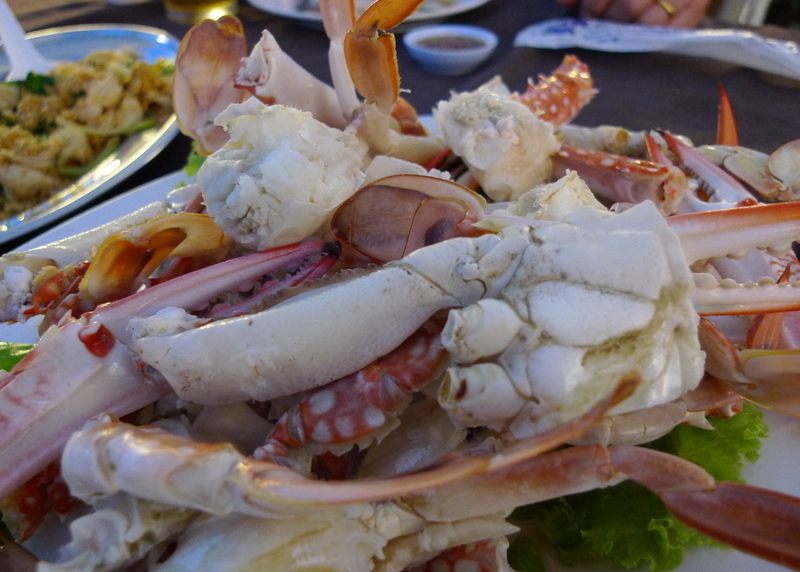 This entry was posted in Uncategorized and tagged Dining, food, Hua Hin, Seafood, Thailand by christao408. Bookmark the permalink. The food looks amazing! I love seafood. 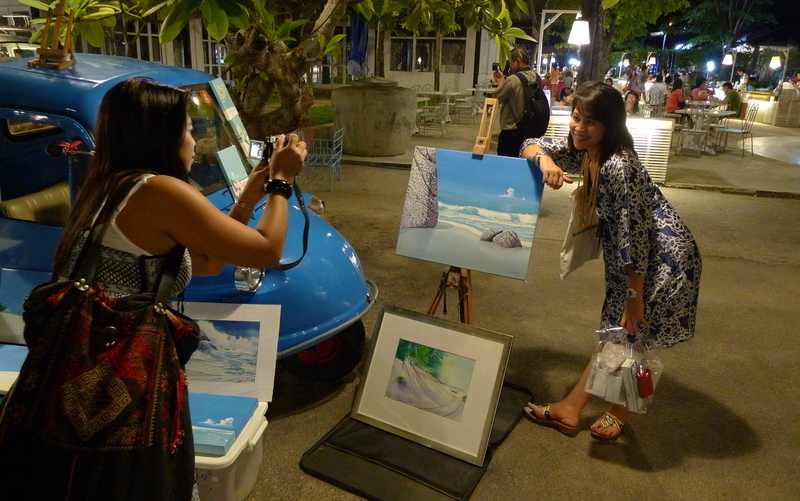 I really want to try the coconut ice cream as well.Btw, the lady who is taking a snap looks quite fashionable. Your blogs are always a delight to read, Chris, though I find myself having less and lesser time to visit Xanga. I’m a seafood lover myself, thus, I can relate how enthusiastic you & your friends are over these shellfish. There is a private American high school that catered to the rich business execs. of the area. They were paying a good salary so my husband applied for a job. We got the usual responses, but did some research on our own, as you always should, and were left with some questions about the school. When we posed those questions to the administrator, she got quite defensive, even bitchy, and told us we were out of line for contacting former teachers or even inquiring about things that were none of our business. Needless to say, we told her to go away and posted a warning to other protective teachers.The thing is, the information we had was NOT bad. It just left us with questions about teaching expectations, administrative procedures and curriculum.So instead, we ended up in Uttaradit.I want that coconut ice cream. yum, that seafood looks delicious! i missed the crabs this year (our lab always has a big crab party in july). maybe i’ll have to go get some crab cakes to make up for it! where is this? I am definitely going! The seafood looks amazing – especially the clams and fried shrimps! I like how the fishing boats were so well colored. I want to taste that icecream. The crab meat with curry and green onions sounds very good. Glad you had a good time.How did the first Anniversary go? That first pic – what an unusual ‘restaurant’! But I imagine that it’s location would make for a very pleasant ‘open air’ meal. Scrambled eggs and crab are not a combination I would have thought of and I doubt I’d get a raw oyster down my throat ! That night market looks interesting and those fishing boats certainly are colourful – they look so packed with stuff though that I’m amazed there is any room left for the fishermen! I love seafood! But yeah, every day is overkill. Ew fried SHRIMP EYES. >_< The rest of the food looks lovely as always, though! I like the composition of the picture right above the fried shrimp eyes, especially with the 2 people walking on that sandbar in the background. the crab meat with the eggs and curry sounds heavenly! Wonder what spot babylone was? Did you get a good look at them? Maybe a mistranslation of some sort of abalone? @alextebow – When I looked, they seemed to be yet another variety of shrimp. But maybe the tank was mislabeled. @Senlin – Thanks, I spent some time composing that one. There was also some cropping done in post-production to produce a more pleasing proportion. (Awful lot of alliteration…)@lil_squirrel4ever – Plus, the cholesterol will kill you! @Chatamanda – Hardly any room for fishermen or, one would think, fish! @ZSA_MD – The anniversary was appropriately low-key. We ended up stopping by a small Italian restaurant in the neighborhood, one that is very quiet and very Italian. The chef came out and talked with us about various dishes to order and we ended up with two homemade pasta dishes that were phenomenal. @Sinful_Sundae – Ah you can always go back and look at the pictures again and again, eh? @rice_eric – The clams were especially good. Garlic and basil and a little bit of broth add a lot of flavor. @kunhuo42 – Maryland crab cakes – yeah! Hang on and I’ll fly there and join you for some! =D@amygwen – Good thing that you found out about the situation before accepting a job there. It would seem that anyone doing interviews would expect the applicant to have done some background work beforehand. 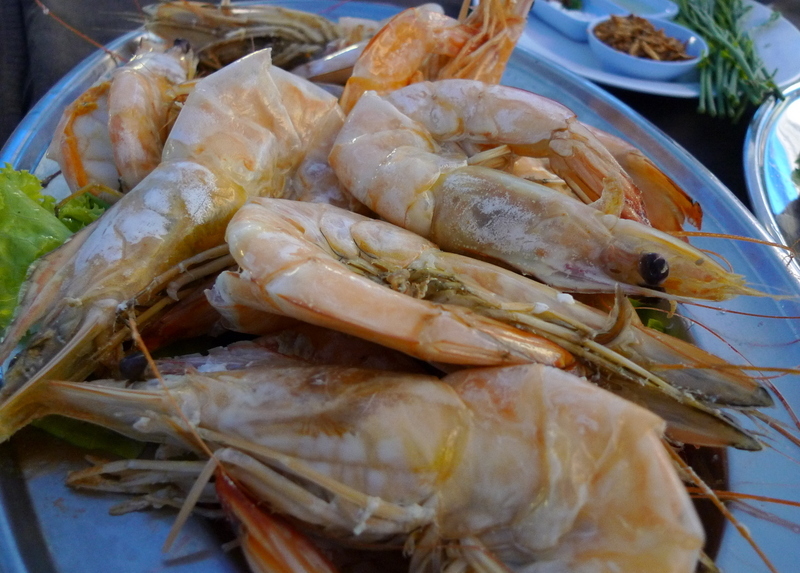 @murisopsis – The prawns were large, although not the monster river prawns that we have here, which look like small lobsters. Regarding the fried shrimp head, there are folks who eat the whole thing, but what you saw in that picture were the leftovers on my plate. @icapillas – And it is a shame you have less time for Xanga because both your comments and your entries are always so enjoyable. @Dezinerdreams – I’ll let her know that you approve of her fashion! @Sinful_Sundae – Despite being on the coast, I’d agree that seafood in LA never seems quite as fresh as here in Thailand. @LostSock21 – Let me get the name for you. 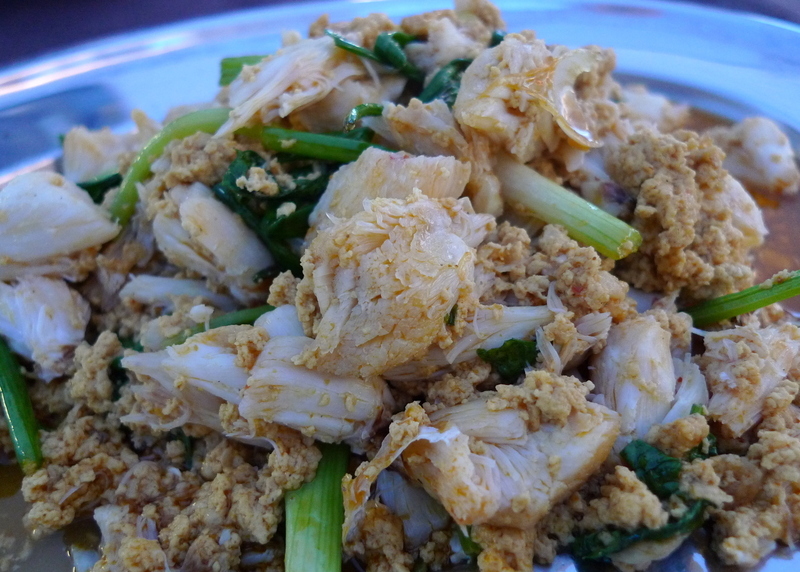 @Umnenga – The crab meat and scrambled eggs really went well together. Please do try it! @yang1815 – It was. Mmmm…. oh wow, that’s a lot of seafood. I didn’t realize Hua Hin was like this. @Sinful_Sundae – Thank you for the recommendation. @ElusiveWords – It is like many things… but a lot nicer than Pattaya. I’m afraid the only thing that looks appetizing is the coconut ice cream. I couldn’t live in Asia… I dislike seafood too much, and seafood is a staple there.